Energizing Electrode! Pokemon One a Day! My concept of Electrode is something grounded in the antithetical department but otherwise dependent on all the "magic" of Pokemon as well. It should be noted that this illustration had started as a draft for Voltorb, in which I realized quite early on that Voltorb is fine on its own. It is the first stage of its line, and therefore should be simple in nature. It's design isn't the most exciting but its certainly unique, even if we first come to dismiss it because of its simplicity. "It's just based on a Pokeball, how is it unique" you ask? Well, because it's a living machine, based on the tool that's made Pokemon training accessible for everyone in the Pokemon world. To imagine that the very tool that would come to tame a creature becomes the creature itself is quite interesting, is it not? I set out to make Electrode something more visually stimulating based on what we know of Voltorb. Obviously, keeping the reversed red and white top and bottom of the capsule was important. This is a defining feature that separates the two creatures. I actually don't mind the flip in the original design, it's just the eyes and the mouth that bother me - the treatment of the feature are so childish and don't fit a living breathing time bomb. First and foremost, I wanted my Electrode to appear as something you clearly don't want to mess with. From actual warning signs painted on the unit amidst caution tape underneath the glaring red LED eyes, you wouldn't dare battle this thing. During the days of war in the Pokemon world, one soldier sought to use Pokemon as a tool to fight his human enemies. This man would eventually come to be known as Lt. Surge, a nickname given to him by both his allies and enemies for the way he handled electric Pokemon, who saved his life and ended others' during the great war. Pokeball technology was nearing perfection just before the war would break loose. With R&D moving towards creating weapons and other technologies, development of the perfect Pokeball was at a stand-still. Surge and his men were be continually pushed back from a strategic point they had planned to take. Eventually, Surge found his back pushed against the Power Plant of Kanto, where a shipment of Pokeballs by Silph Co. were being held. He was relieved - he could capture Pokemon in the area to use as weapons and claw their way out of the corner they were stranded in. However, Surge and his men would be devastated to find that the Pokeballs found in storage were that of defective units. Pokeballs that were developed at Silph Co. HQ were shipped to the Power Plant to be activated with the electricity there to finalize the manufacturing process. It seemed that all the functioning Pokeballs had already been shipped out, crushing the hope Surge had created with his makeshift plan. Surge and his men instead waited and fortified the Plant the best they could until their enemies marched to their doorstep. Gunfire would soon echo throughout the impromptu base when things would take a turn for both sides: the warfare that had ensued would startle a resting Zapdos that made the Power Plan its home in the last decade. The god-like creature summoned bolts of lightning that crashed upon the Plant, sending the machines and generators into a state of emergency. The supercharged electricity now crashing all around the men fighting struck and killed everyone in the battle, including the man who would come to be known as Lt. Surge. I mean, it wouldn't be possible to survive such an attack...Would it? The young soldier was near death and had lost consciousness. Surge would be soon be awoken to a low humming noise and a tingle of energy running through his body - the defective Pokeballs seemed to be moving on their own, taking on life and had huddled around hi, Jolts of electricity coursed through his body which would miraculously invigorate the man who had been knocking on Death's doorstep. As the lone survivor of warriors, Surge walked past his allies and comrades, all of who were burnt to the point of being indistinguishable from one another. A quiet rage was now stirring within the young soldier as he walked past his former friends towards the entrance of the plant. Surge then turned his attention to the creatures around him, once thought to be defective and destined to be destroyed, they were now full of life and energy. He would come to call these beings "Voltorbs" and made his way to the entrance of the plant. Following him was an army of the Voltorb, who stopped when he did - standing before them was an insurgent. Another survivor. Surge looked the man up and down - he was not a threat, he was barely alive. It seemed that the soldier had witnessed everything: Zapdos' rampage, the accident triggering the generators, the Voltorbs coming to life, both sides being killed in the aftermath and Surge absorbing electricity like a machine to come back from near death. Surge's eyes locked with the soldier who was cowering in fear. The soldier turned away, attempting to run. "You know, I could kill you right now," called Surge. His voice was quivering but soon grew to a commanding tone with new found confidence as he felt the electricity of the Voltorb around him. The soldier stopped in his tracks. He began to quietly sob. "But then no one would know what had happened to your platoon. Get up and run, and don't look back. Tell them what happened here, on this day. Tell them that thunder and lightning shall end this war. Tell them that the storm born (;P) are coming,"
The man shook his head, sweat flying off his brow and hair. Without turning to look at the man he would nickname Surge, he fumbled towards the exit of the plant. Weeks would pass since the accident, and the soldier had made it back to his platoon. He had told his CO and supervisors what had happened...rumors began to circulate of the event that transpired at the plant...That a soldier cheated death and was walking with living weapons born of thunder and lightning of the demi-god Zapdos. That man was a surge protector of sorts it seemed, able to absorb lightning that would kill all men otherwise. Surge rose through the ranks and became a legend, using Voltorb and Electrodes as grenades and landmines. With power and force Surge would end the war, which was nearly 60 years ago. Since then, the electricity that runs through his body keeps him at the state he was when the accident took place, providing him a youthful appearance and vigor that only electricity could provide. So that's the origin story of how Pokeballs would become their own creatures in the Bonnyverse! Voltorb and Electrode largely vary from one another in design depending on their defective states as Pokeballs. Some Voltorb might not have the button to release Pokemon seen on the Pokeball, others might have painting errors, poor circuitry, etc. 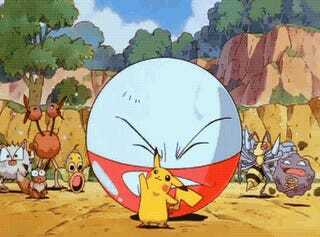 Now, how do Voltorb become Electrode, you ask? When a Voltorb absorbs enough electricity, the influx of power passes the threshold set by Zapdo's initial burst of electricity and triggers the machinery to reach a new level of sentience. This sentient AI repairs the defective Pokeball it was born of as far as it can, building new features such as eyes as represented by LEDS that record through a pseudo camera like set up, and even creates holes of a mouth in front of a speaker system used for basic levels of communication. The trade off for this upgrade, however, is that its ability to maintain and store electricity has been compromised. The delicate nature of the new hardware to produce the new features means Electrodes have high risk of releasing electricity or self destructing. Surge was perhaps the first and last trainer to be able to handle Voltorb and Electrode, and explains why anyone rarely attempts to train one. Basically, I wanted this design to look like something man-made, created to be a weapon but still look like it has life, as a nod to the original design. The eyes "humanize" it a bit more, and adding the speaker-holes where the mouth should be is a way to translate the old design element in a way that's fitting for the new depiction. I specifically made it frowny to make it appear more menacing. Another thought that went into designing the work is how it could function as a weapon as well as how it releases its power. The button at the top is used by the soldier to detonate Electrode after a timer starts. Electrode will then roll towards it target at ridiculous speed, catching them off guard and giving them little chance to escape. When Electrode implodes or releases electricity, it does so by splitting the top half of its body open and revealing a generator that is the source of its power. Bolts of electricity fly around it like shrapnel, doing massive damage to living creatures. 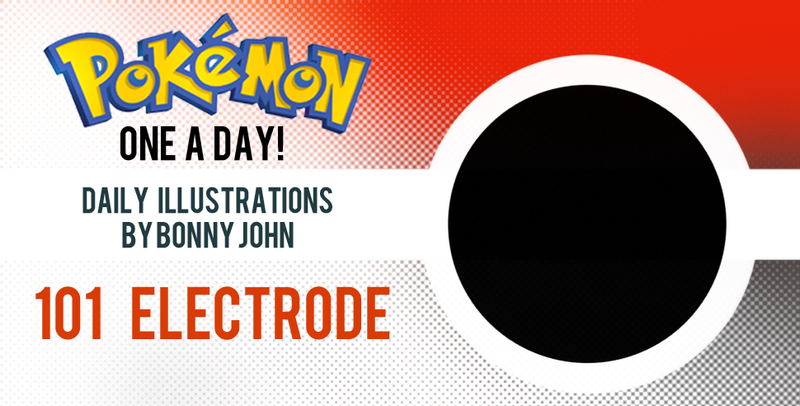 Electrode is now Bonny John approved! I'm not suggesting this should've been the design - it's way too detailed and more of a chance for me to make do with what Nintendo gave me. That said, I really had fun with this one, both in drawing out the work and writing up the back story. I know it was long but I hope you enjoyed it! Electrode is ready to roll out and leave its stupid design with silly cartoon pupils and weird human like dental set up in the past! Thanks as always for stopping by!